Queensland transport businesses, producers and the general public are asked to look out for a highly invasive, foul-smelling pest insect that likes to hide and ride in freight vehicles, cargo containers and furniture and appliance packaging materials. Biosecurity Queensland Plant Biosecurity Officer Rebecca Sapuppo said early detection is the key to controlling the brown marmorated stink bug and stop it spreading to Queensland. “The Australian Department of Agriculture and Water Resources is responsible for national border quarantine controls and they have enhanced cargo inspection regimes to minimise the chance of this exotic plant pest establishing in Australia,” Ms Sapuppo said. “However, this stink bug is such a serious threat to our agriculture and urban environment that every Queenslander needs to play their part in looking for and responding to suspect incidents of the pest. Early detection is the key to successful eradication. Ms Sapuppo said the pest insect which has spread to all Northern Hemisphere continents ‘hitchhikes’ with goods containers and can cause major damage to fruit and vegetable crops and ornamental plants. 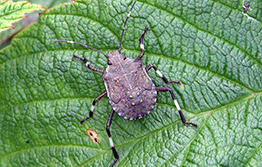 “The brown marmorated stink bug feeds on a wide range of more than 300 plant species and its saliva causes significant damage to plant tissues. “This pest causes damage to fruit and seed production, reducing both yield and marketability. If it’s on fruits produced for juice extraction, such as grapes or citrus, the insect may taint the entire batch of juice with a bad taste and smell, making it unsuitable for sale. Once established in a cropping situation, effective control is difficult. “In the Northern Hemisphere, this pest insect has been known to seek shelter over winter inside homes, vehicles, machinery or sheds, often in very large numbers. September to April is the bug’s favourite time to travel and Ms Sapuppo asked Queensland transporters, farmers and residents to be on the lookout. “Anyone who works around or receives imported goods should be vigilant for this pest which can be attached to containers, within the goods inside the container or to other goods like machinery,” Ms Sapuppo said. “In crops and backyards, they’ll most likely be seeking food and can be found by visually inspecting the plants. “If you suspect you have seen a brown marmorated stink bug, whether it’s dead or alive, take a photo and report the location to Biosecurity Queensland by phoning 13 25 23.